Fall weather has hit most of the country by now. Even down here in sunny South Florida our temperatures have dipped below 80 degrees. Brrrr….it’s almost a cold front! When Sunday Supper announced that they were doing a Warming Trends event, I started thinking of the spices that give me warm thoughts: cloves, nutmeg, ginger and cinnamon. What better way to bring them together than in a pumpkin cheesecake. To elevate this dessert even further I scooped out mini pumpkins and baked the cheesecake in the pumpkins. Talk about a gorgeous presentation. 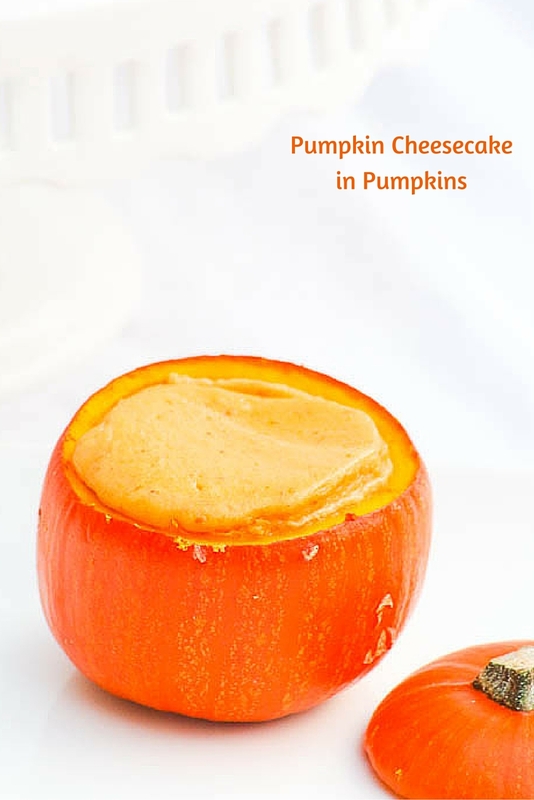 You can cool the Pumpkin Cheesecake in Pumpkins and then decorate the outsides for Halloween or serve them as they are for an elegant Thanksgiving dessert. One thing is certain; you are going to have very warm feelings with each and every bite. Pumpkin Cheesecake in Pumpkins may be served warm or cold. The flesh of the pumpkin is delicious with the cheesecake. 8 mini pumpkins, 4" - 6" in diameter - this number may vary depending on the size of the mini pumpkins. Cut the top off of each pumpkin. Scoop the pulp off the top and place the tops on a parchment lined baking sheet. Scoop out the pulp from each pumpkin and wipe down the sides. Place the bottom of the pumpkins on a second parchment lined baking sheet. Set aside. Beat the cream cheese and sugar together in a large mixing bowl until the mixture is creamy. Add the eggs one at a time. Blend in the pumpkin, spices and vanilla. Use a large ice cream scoop to transfer the batter into the carved out pumpkins. 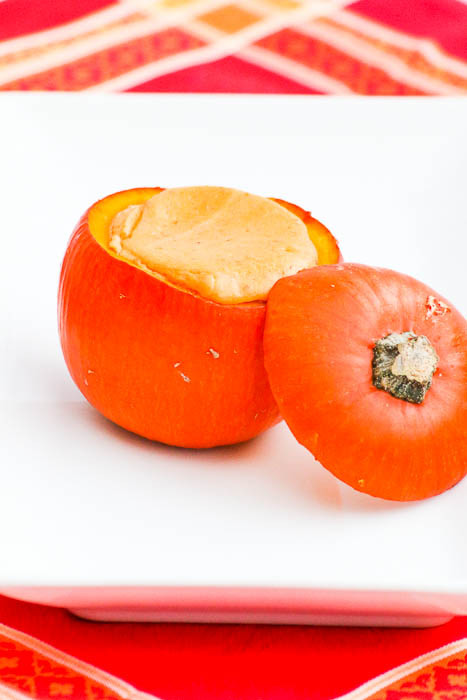 Each pumpkin will hold approximately ½ cup (4.35 ounces) batter. Bake the cheesecake filled pumpkins at 325º for 35 minutes. Remove from the oven and cool completely. Bake the tops, stem side up, at 325º for 20 minutes. Remove from the oven and cool completely. Pumpkin Cheesecakes in Pumpkins may also be served warm. Many thanks to T.R. Crumbley from Gluten Free Crumbley for being the host with the most! 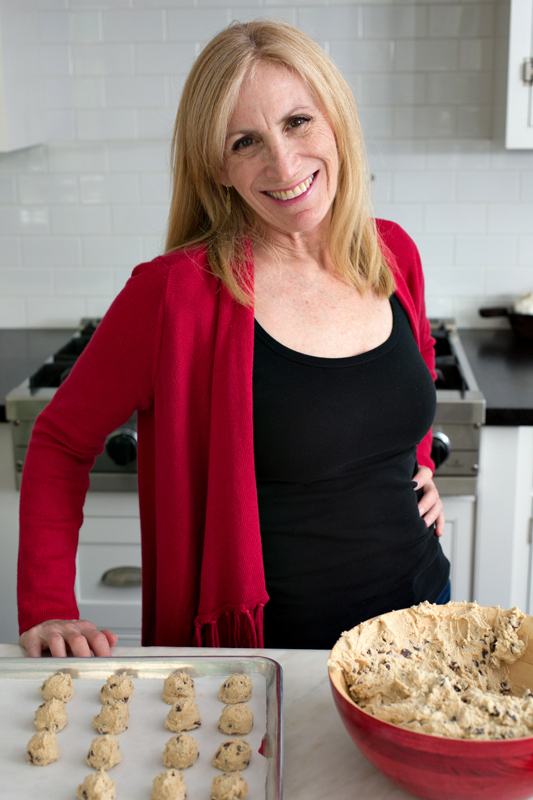 Be sure to check out all the other Warming Trend suggestions from my Sunday Supper family! This seriously could not be any more clever — and the fact that it’s pumpkin cheesecake — where’s my spoon? Thank you. Dig right in! I don’t think I’ve ever seen dessert served in a pumpkin, how cute are these? I love that you don’t have to bother making a crust either! These are so cute! Thanks so much. I really love the ease of scooping and filling! How festive and fun is this, plus I love your video, nicely done! 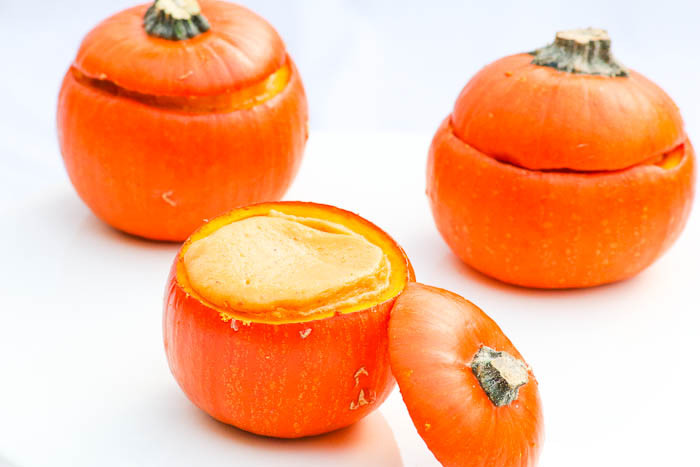 What a great idea to serve these in pumpkins! Thank you. They are lots of fun, too!! I think these minis are the perfect way to keep me from eating more than my fair share in one sitting! Such an adorable presentation. I can see these on my Thanksgiving dessert buffet! I have a minor obsession with mini pumpkins and anything I can put in them, so you can bet I will be trying this out! This makes me so happy, Sarah. Thank you! Wow! I love the idea of using the emptied pumpkin for presentation. Perfect for this time of year. Thanks, Tara. They make for a stunning and tasty presentation. Great serving idea for cheesecake! Wow, your pumpkin cheesecake just looks so amazing! I can’t wait to make this for our next gathering. Thank you for sharing. Thanks so much, Hafsa. I hope you enjoy it!! Thanks so much, Judy. They are a fun dessert to serve on Thanksgiving. These are so creative! What a great idea. Thanks for the recipe!